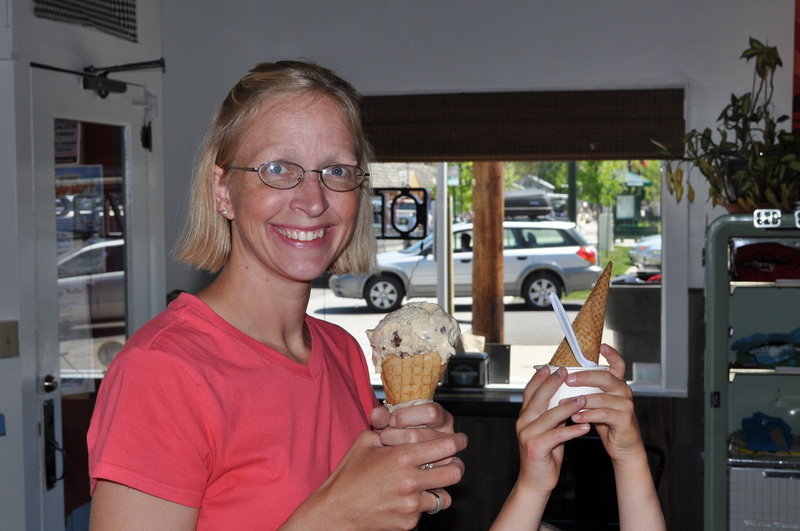 We recently read a review for an ice cream shop in Whitefish, Montana called Sweet Peaks. It just so happened that we were passing through Whitefish on our way to our 4th of July camping destination. In my opinion, ice cream should be a food group. I would live on the stuff if I could get away with it. I prefer the chocolate varieties, Cookies and Cream being my all-time favorite, but I like the fruity flavors, too. Come to think of it, besides coffee, there is not a flavor of ice cream that I don’t like. I am drooling on my keyboard just thinking about it. 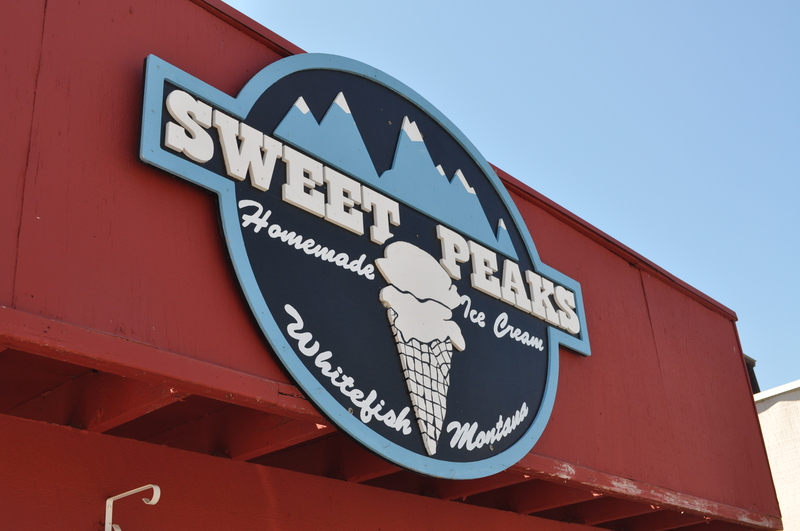 Sweet Peaks was all the review said it would be, and more. 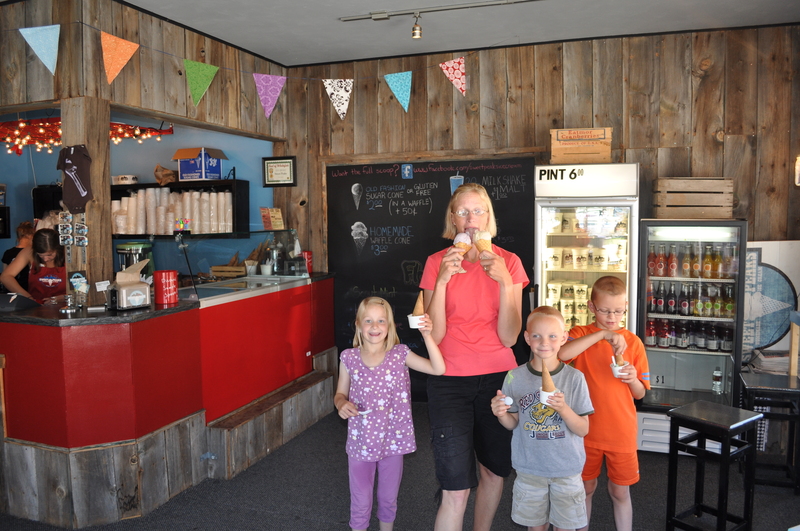 The shop itself was adorable, the staff beyond friendly, the ice cream… heavenly. 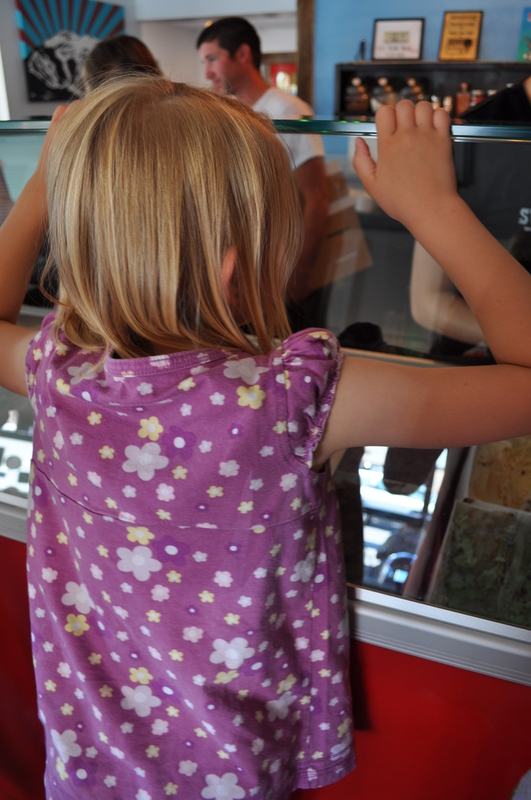 Their waffle cones melted in our mouths. Literally. The kids all went with Scout Mint. Rob chose Huckleberry. I decided on Peanut Butter Heath. Rob made the mistake of handing me his ice cream cone so he could take a few pictures. I must say, the huckleberry ice cream is scrumptious! I’m not sure I would have traded my Peanut Butter Heath for it, but I enjoyed the licks I got before he snatched it away! Sweet Peaks is definitely worth the time. I would say that you should stop in if you are ever in the area, but that wouldn’t be entirely correct. I personally think this little ice cream shop is worthy of being a vacation destination in itself. Your family might think that you are crazy for driving 1300 miles for ice cream, but trust me, once you taste this oh-so-scrumptious, melt-in-your-mouth goodness, you will have no doubts that it was worth the drive! This entry was posted in Crazy Kids, Daily Life, Family Adventures and tagged ice cream, Montana, postaday2011, Sweet Peaks, Whitefish. Bookmark the permalink. I shall have to take your word for it Mariah. From BG it is more than 1300 miles. Looks good, Tastes Good and by Golly ..It does you good! I’m sure you have some equally yummy ice cream in your neck of the woods. 🙂 You’ll just have to keep it in mind if you ever find yourself on this continent! It looks like a fun vacation spot. Is there room for a camper? I especially like your choice of ice cream, too. Sounds yummy!